Found 11 file extension associations related to ANSYS DesignModeler and 9 file formats developed specifically for use with ANSYS DesignModeler. Creating design models is a core part of the product development process and the first step of the simulation process. These models can be of a geometry form representing the actual design detail, or they can be an approximation of the design using simplified components like beams and plates. 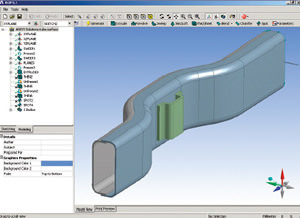 Simulation often demands unique modeling capabilities that typical CAD operations do not require. Therefore these capabilities are either lacking in CAD systems or implemented in a fashion that is not optimum for performing simulation related functions. DesignModeler is a Workbench application from ANSYS that provides modeling functions unique for simulation that include detailed geometry creation, CAD geometry modification simplification and concept model creation tools. DesignModeler offers geometry creation features like extrude, revolve, sweep, chamfer functions and others to create fully parametric models. These models can be used with any ANSYS core simulation product or with products like ANSYS DesignXplorer for performing design optimization. Concept models are used in a product development process prior to any detailed CAD geometry being created. These design approximations, along with simulation results, are extremely useful in making product decisions early in the design cycle when product costs can be impacted significantly. DesignModeler has tools for creating these models quickly and then, with ANSYS simulation tools, easily predicting how the proposed design will perform. DesignModeler can read geometry from any Workbench-supported CAD system. Those parametrically supported CAD systems will also be parametrically associative in DesignModeler. In addition to importing data, DesignModeler can also export data as Parasolid, IGES and the ANSYS ANF geometry format. The ANSYS DesignModeler software seems to be old or discontinued. If you need more information please contact the developers of ANSYS DesignModeler (ANSYS Inc.), or check out their product website.